These articles discuss particular developments in the field of Tibetan Studies. Another good way to gain a sense of the field is to survey the published Proceedings of the International Association for Tibetan Studies, issues of the Journal of the International Association for Tibetan Studies, or to explore other resources also available through the online Tibetan and Himalayan Library. Nakane, Chie. "New Trends in Tibetan Studies [in the PRC]: Towards an Elucidation of Tibetan Society." Acta Asiatica 76 (1999): 7-39. Tuttle, Gray. “Modern Tibetan historiography in China.” Papers on Chinese History. Spring 1998. 7: 85-108. Wehrli, Eugen. “Tibet Research in China by Tibetans and Chinese after 1949.” Proceedings of the International Seminar on the Anthropology of Tibet and the Himalaya, September 21-28, 1990, at the Ethnographic Museum of the University of Zuerich, Ethnological Museum of the University Zurich, 1993. Chaphel Tsetan Phuntsok. "A brief account of ancient Tibetan historical records." Tibet Studies (Lhasa) 2, no.1 (1990): 1-10. Matsumoto, Shiro. Tibetan studies in Japan, 1973-1983. Tokyo: [Centre for East Asian Cultural Studies], 1986. Sato, Hisashi. "The Origins and Development of the Study of Tibetan History in Japan." Acta Asiatica 64 (1993): 81-120. Fukuda, Yoichi. "Japanese research on Tibetan Buddhism, 1984-98." Asian Research Trends (Tokyo) no.9 (1999): 1-18. Ishihama, Yumiko. "Japanese research on Tibetan history, 1985-98. "Asian Research Trends (Tokyo) no.9 (1999): 19-33. Blondeau, Anne-Marie. "Les études tibétaines." Cinquante ans d'oriealisme en France(1922-1972). numéro special du Journal Asiatique 266 (1-4): 153-174. Kolmas, Josef; Sron, Galina S. "Works on Tibet by members of the Leningrad Department of the Oriental Institute of the Academy of Sciences of the Soviet Union 1968-1980." Archiv Orientalni (Prague) 50, no.2 (1982): 174-184. Dutch Studies on South Asia, Tibet and Classical Southeast Asia Resource developed by Dory Heilijgers, former librarian of the Kern Institute, and launched in 2013. One leading journal in the field of Tibetan Studies is the Journal of the International Association for Tibetan Studies (JIATS), which is hosted by the University of Virginia and available for free access online. This journal is edited by various scholars in rotation, and includes an extensive book review section. 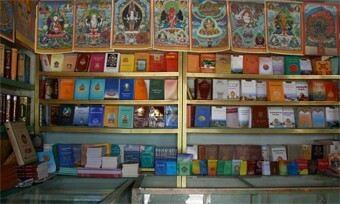 Another leading journal is the Tibet Journal, published in Dharamsala. Current and back issues are now available online. Tibetological research is also frequently published in Asian Studies journals, such as the Journal of Asian Studies (Michigan), also publish Tibetological research in their Inner Asian or otherwise designated sections. Not least, Tibetan scholars often publish in the specific journals of their disciplne, such as the Journal of International Association of Buddhist Studies (Vienna), etc. Although there is no comprehensive online bibliography for Tibet-related research in western languages, excellent (though now dated) print editions are available. See General Bibliographies. In the PRC, the leading journals are China's Tibetology (Beijing; Tibetan, Chinese and English versions available) and Tibet Studies (Lhasa; Tibetan and Chinese versions available). Note that the various editions are not exact translations. Rather, the articles selected vary, but the issuing body is the same. For an overview of indexes, including the online Bya-ra Database with more than 10,000 bibliographic entires for Tibetan-language research articles published in the PRC, see the Periodicals section of this Guide. An ever-growing resource for reviews of new dissertations in Himalayan and Tibetan Studies can be found on this well-curated and helpful website. If full text is not available, PQDT provides abstracts and/or citations. To find Columbia theses and dissertations that are not available in full-text online (above), search CLIO: Dissertations (this searches both the Library Catalog and Academic Commons). The catalog treats theses and dissertations like books. Search by author, title, keyword or LC subject heading. In the catalog, the term "thesis" denotes both Masters' theses and dissertations. A keyword search for "thesis" and "Columbia University" will find all theses and dissertations produced at Columbia. You may also narrow your search by including the name of the department or school. ETHOS. British Library electronic these online service. SHODH GANGA. Repository of PhD. theses by students at universities in India. A truncated search for "tibet*" will generate a few dozen related dissertations.